I am loving this for all the right reasons. The Beer Shed – Great Beer made By You. Being a home brewer of our favourite undistilled whisky, beer, I came across this site only this morning and thought "you dirty buggers that was my idea, nice one". A few of us D.T.W.C. members are have a little brew swap on the side of every meeting and I can see several members wanting but unable to afford the time to get in on the action. Well if you do not have the space, time, or equipment, but want to have a go at just how easy your can make your own beer then why not try The Beer Shed. 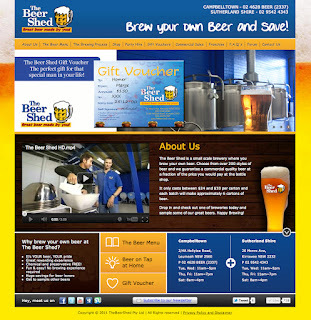 "The Beer Shed is a small scale brewery where you brew your own beer. Choose from over 200 styles of beer and we guarantee a commercial quality beer at a fraction of the price you would pay at the bottle shop." I have seen a few micro breweries dabble in this idea buy generally do not have the time, or means to manage the process and store the beer in amongst their own commercial enterprise. Good to see someone has a process now in place. Even for me being a home brewer I am keen to try as I have always wanted to take things up a notch and experience making beer in a professional environment. Nice one guys you will be seeing me soon.